Dunlop MSA British Touring Car Championship front-runner Rob Austin is determined to return to heavy points scoring consistency when the category makes its annual trip north of the border to Knockhill in Fife this coming weekend, 12th/13th August, for rounds 19, 20 and 21 of the season. As one of the Evesham racer’s favourite tracks, a venue where he has excelled in the past with four podium finishes, the Handy Motorsport driver is determined to hit back from the disappointment of Snetterton a week ago when he was twice the victim of contact. 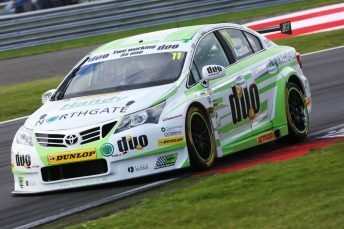 Frustratingly, the No.11 Toyota Avensis clearly had the pace to again challenge for silverware as the BTCC arrived in Norfolk so the start to the second half of the season very much became a missed opportunity with enforced retirements in races one and three through no fault of his own. While Knockhill is a venue Austin has a deep-rooted affinity with, first racing there back in 1998 in Formula Renault single-seaters, the challenge will be a tough one with his front-wheel drive Toyota not as suited to the tight, twisty and undulating 1.26-mile track as the rear-wheel drive cars. “After a tough weekend at Snett, that saw us unceremoniously removed from two of the three races, I am looking forward to getting back on track at Knockhill”, he commented, “I absolutely love the Knockhill circuit and the support from the fans north of the border is always incredible. Austin, of course, has been on the other side of the battle having piloted a rear-wheel drive Audi A4 for five seasons prior to joining Handy Motorsport for the 2016 season. Qualifying on pole position and taking a brace of podiums at Knockhill in 2013 with his famous self-run ‘Sherman’ Audi, third in race one and second in race two, in 2014 the Worcestershire ace doubled-up again. Missing out on victory by a mere 0.2 seconds in the opening contest, Austin went on to add his second podium of the weekend in race two with third place. Last year, his first at Knockhill with front-wheel drive, Austin achieved a best finish of seventh place for Handy. He added: “Obviously the rear-wheel drive cars are very strong this year and there are some cars out there that still have a power advantage. Knockhill’s tight final turn, followed by a long uphill drag to the finish line, really favours the RWD traction and those with a little extra under the hood. The rest of the circuit rewards a good chassis and a brave driver though and we tick both of those boxes. Opening free practice at Knockhill will get underway at 10.00 on Saturday, 12th August, with session two taking place at 12.50 and qualifying following at 16.10. On Sunday, 13th August, round 19 will begin at 11.50, round 20 will start at around 14.15 and round 21 will begin at 17.10. Qualifying and all three races will be streamed live online at www.itv.com/btcc with the addition of live television coverage on ITV4 throughout raceday.